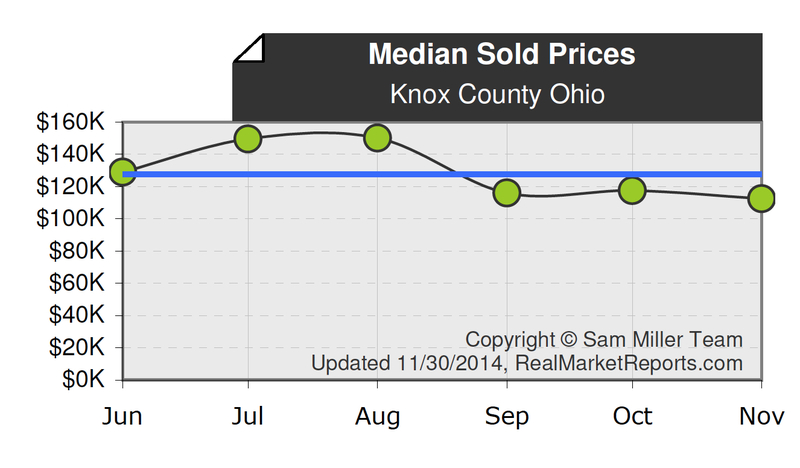 During the last 10 years the Knox County Ohio housing market has followed a consistent trend relating to monthly sales. During the winter months the Knox County Ohio housing market reports fewer home sales and at a lower average sales price than during the peak real estate months which traditionally run from April through August. The graphic above represents a common pricing trend that shows that the Knox County Ohio housing market peaks during the summer months. The reality is that our community consistently buys more higher priced homes during the summer months and before school starts each year. The graph represents a common market trend which relates to families buying and selling homes during the summer before school starts but there is a hidden factor you may not have considered. During the sunshine months the number of expensive waterfront homes that sell at the Apple Valley Lake greatly influence the median sales price. When the boating season is over and the lake market cools off we simply don't sell as many of those more expensive waterfront homes which brings our median price of SOLD homes back to where it would normally be prior to the influence of those higher priced homes. If we were to show a report and exclude the waterfront homes the median SOLD price of a home in Knox County Ohio would be roughly $115,000 during the same 6 month period. You can view and compare all of our available Knox County Ohio homes for sale and we have organized them in price order for quick and easy viewing. 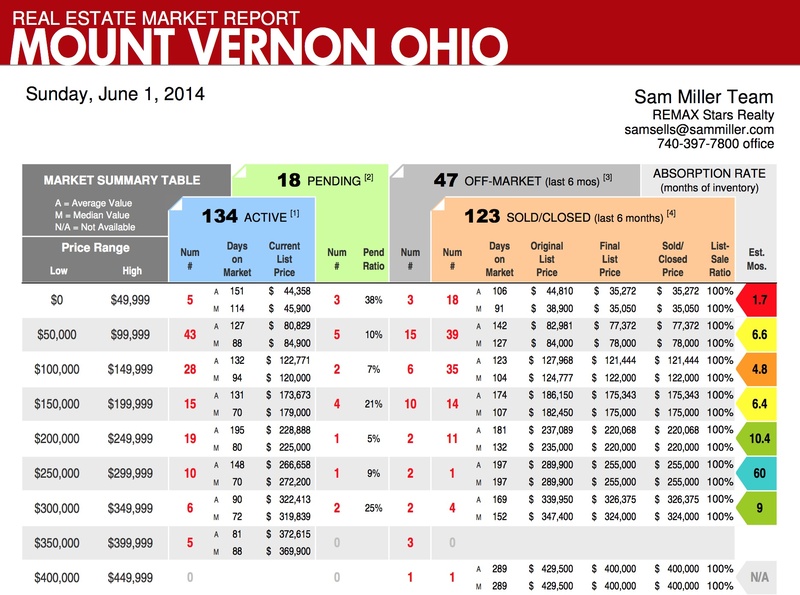 The real estate activity in Mount Vernon, Ohio is experiencing a positive shift in buyer activity. As many of you already know the winter weather in Central Ohio was one of the most challenging in over 20 years with a few weeks of extremely cold temperatures approaching 20 below zero. This is VERY rare for Central Ohio and this winter there truthfully were times when it was so cold that buyers didn't want to come out and look at homes...they simply stayed home until the weather warmed up. The report below gives you a detailed view of the Mount Vernon, Ohio housing market highlighting active listings, pending home sales, expired listings and off markets as reported to the Knox County MLS. 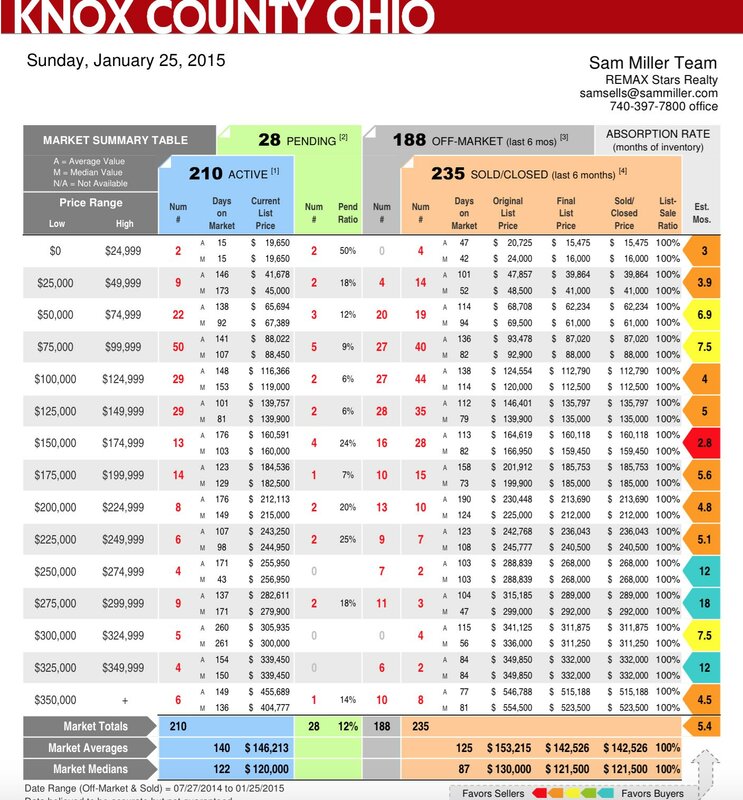 This information is very helpful for my real estate team, my lenders, the appraisers I work with and it is VERY helpful to the buyers and sellers who are working with The Sam Miller Team because it helps them better understand the current housing market in Knox County Ohio. Take a close look at the far right column and you will see some detailed statistics titled "Absorbtion Rate which is the current number of inventory in months. This information is color coded and you can tell which price ranges specifically favor a seller and which price ranges favor buyers. The way we can determine this is based on the estimated months supply of inventory based on how many homes have been selling on average each month. If you are in the market for a Mount Vernon Ohio home for sale be sure to click on this link and take a closer look at all of our available Mount Vernon Ohio real estate listings organized by price. Home sales in Knox County Ohio are on the rise and last month the Knox County Board of REALTORS MLS system reported a 5% increase in homes sales inside the county. What is equally interesting is that there were 46 new listings added in January and a total of 311 homes listed within the county per the local MLS. This is a positive sign and many experts believe we are headed towards a more stable housing market. The FEDS recent announcement to not raise the FED rate adds to the good news for real estate and most businesses associated with the housing market. January 2012 was one of the most active Januarys for our real estate team since 2007. 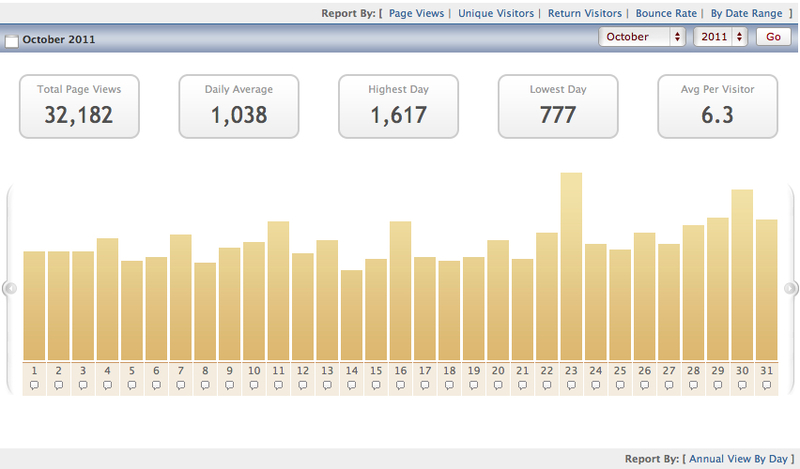 Showing activity on our personal listings was way up over the showing activity in January 2011. Not only did we receive more physical property showings on our listings but our virtual home showings from our knoxcountyohio.com website was up a significant amount. Our knoxcountyohio.com real estate website experienced listing page views and traffic numbers that matched our 2nd single biggest month ever and the record months are usually recorded during the peak home selling season in the summer months. The reason I am sharing this with you is because it confirms a trend that our local market activity is on the rise and I believe their is a high probability this trend will continue throughout 2012. Thinking of purchasing a home? Home pricing is down and mortgage interest rates are at a 50 year low. Home sales in Knox County Ohio started 2011 off with a slightly slower pace due to the unseasonal winter weather and snow conditions that lasted until April. The good news is that once the spring housing market arrived home sales jumped right back on track. 2011 was the year where we experienced some of the lowest 30 year mortgage interest rates that we have seen in more than 50 years. With the low interest rates came low monthly payments for those who qualified for a home loan and this spun the economic wheels and helped stimulate the Knox County Ohio housing market. 2011 was the year of the "1st Time Home Buyer" in Knox County Ohio. Our team and I experienced so many transactions in 2011 where we were helping a first time home buyer purchase and we were able to help them obtain a lower monthly payment on a home of their own than they were previously paying for rent in an apartment. Monthly payments today are still approaching a record low and there are still zero down payment and low down payment loans available today. If you have given any serious thought about buying a home now may be a good time for you because the asking prices of most homes are down and when you combine lower prices with record low interest rates you have the perfect combination for long term financing saves and the making of a great investment. The Apple Valley Lake continues to be an active housing market and sales have remained relatively strong over the last 5 years. There were 85 Apple Valley homes that sold in 2011 according to the Knox County Ohio MLS as of January 2nd, 2012. It should come as no surprise that 85 home sales at the Apple Valley Lake didn't break any home sales records but 2011 was within 8 homes sales of matching the 2010 Apple Valley home sales numbers. One of the key factors that caused Apple Valley to not match or surpass home sales figures of 2010 was because in 2011 we had a very long winter season with snow on the ground all the way into April. The reality is that the second half of the year in 2011 was actually stronger than in 2010 which is a sign that the market was headed in the right direction. 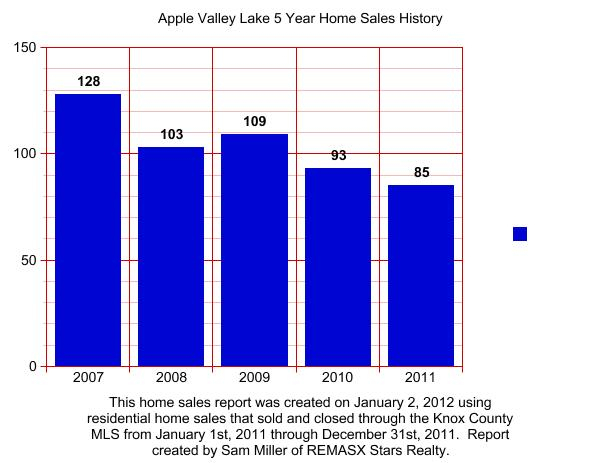 2011 was a great year for our real estate team regarding home sales at the Apple Valley Lake, lots sales at the Apple Valley Lake and real estate sales in general within Knox County Ohio. We were pleased to lead the local housing market for the 20th consecutive year for most homes sold and we successfully sold and closed 203 real estate transactions which is nearly triple the transactions compared to the nearest real estate team in Knox County Ohio. If you are considering making a move in 2012 to the Apple Valley Lake or even if you just want to purchase a cheap Apple Valley lot so that you can lake and amenity privilidges at the Apple Valley Lake, The Sam Miller Team we would love to be your Apple Valley Lake REALTOR. You can view available Apple Valley Lake homes for sale and we have also created a special listing which which contains Apple Valley Lake lots for sale and both links are conveniently organized in price order for easy viewing. 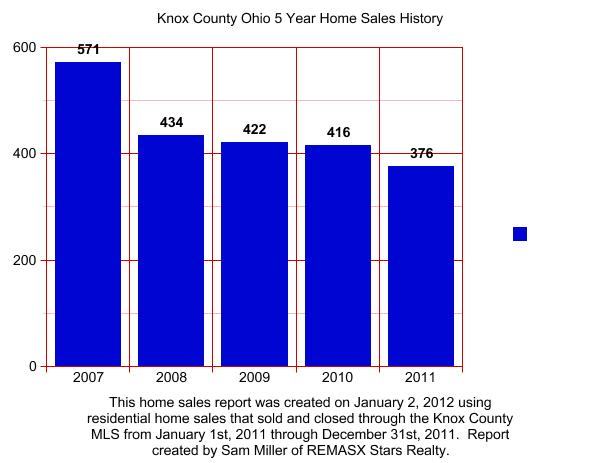 It's December 1st and here is your Knox County Ohio November 2011 home sales report. 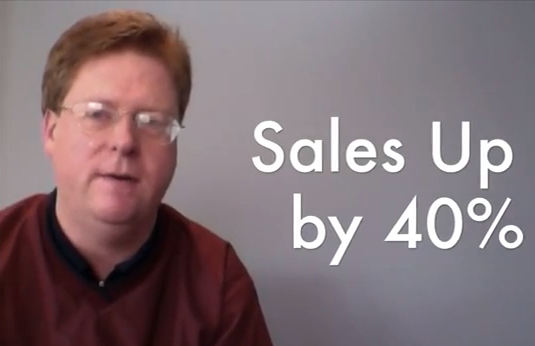 Residential homes sales in November 2011 were up 40% compared to November 2010. This is a HUGE increase and I purposely compared the exact same months instead of comparing November 2011 with October 2011 so that I could demonstrate the significance of our recent home sales activity increase. November 2011 and October 2011 were both WAY up regarding home sales and neither of these months were up just slightly either. October was up by about 30% compared to the previous October 2010 and this November was up by 40.9% as of today and there might even be some November home sales that haven't been report to our local Knox County Ohio MLS yet either. This November we saw a positive shift in specific price ranges that were selling. 80.6% of the homes that SOLD this past November sold between $50,000 to $175,000. This means that both the entry level priced homes and the mid price range homes were most active. This also means that 4 out of 5 homes that SOLD in November sold in this price range. This is a very positive market shift because during the fall season in Knox County Ohio the housing market generally slows down when the colder weather arrives. When the lower and more average price range homes are selling...the owners of these homes traditionally move up into larger and more expensive homes. When this happens it can help create additional interest, activity and more home sales in the mid and upper price ranges. Many of the serious homebuyers that are in the market today already own an existing home and most of them need to sell their current home so that they can take advantage of the exceptional opportunities that are available in the market today. I recently read that the current home pricing is comparable to price levels that existed between 1998 - 2001 before the rise of the housing bubble. This is significant not only because of the current lower housing prices but because when you combine todays lower pricing with some of the lowest mortage rates in over 60 years you have arrived at potentally the most affordable time in the past 60 years to buy and own a home. There will be people that you know who will look back on 2011 and 2012 and wish they had bought a home during one of the most affordable times in history. The opposite side of this is that the many wise homebuyers will look back on this time as one of the greatest home buying opportunities to buy low, enjoy the benefits of home ownership while creating an opportunity because buying low and selling high is one of the keys to building financial security for later life. Will you look back on 2011 and 2012 and say "I wish I would have bought a home when the interest rates were 4%?". May 2010 Home Sales - There were 54 homes that sold for a grand total of $6,241,542.